My girls love horses, adventures, and stories they can relate to. They get all of that reading about Andrea Carter growing up in Susan K. Marlow's books. 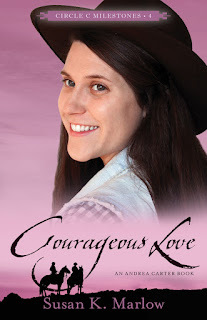 Courageous Love is the newest book about a young girl that just finished high school and would rather work the ranch and learn to trick ride than worry about becoming a woman. Andrea's older brother Chad runs the Circle C Ranch since their father had passed away several years ago. He has a lot of duties to take care of and relies on his wranglers to help get them done. Riley Prescott is one wrangler that has been around for years that Chad trusts completely. Andrea talks Chad into letting Riley teach her to stunt ride and the two of them usually end up working together. The two of them discover the beginnings of a mystery that has everyone on edge. Andrea has to keep her courage up and protect her other brother Justin's family while he is away on business. Criminals from past books are out for revenge no matter the cost to the Carter family. Susan K. Marlow has written stories about Andrea Carter growing up in the 1800s on the Circle C Ranch in California. You can read about her when she is little in the Circle C Beginnings, then Circle C Stepping Stones, next the Circle C Adventures, and lastly as a teen in the Circle C Milestones. The Goldtown book series was also written by Susan and follows a young boy during the gold rush days. Susan writes in such a way that all three of my girls love. We have read almost all of her books and we were eagerly awaiting the release of Courageous Love. This fourth book in the Circle C Milestone Series did not disappoint. It was just as good as her other books. Disclaimer: I received Courageous Love free of charge as part of the Kregel Blog Tour in order to write my honest review. All opinions are my own and no other compensation was received.